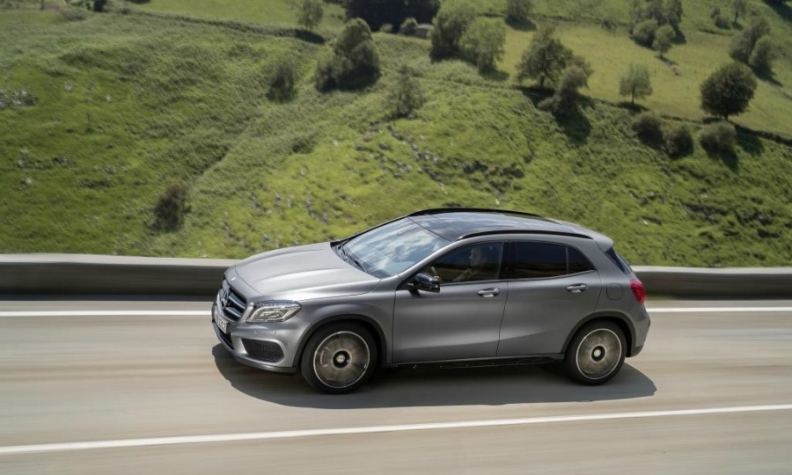 Mercedes said global sales of compacts including the GLA, shown, rose 19 percent last month. FRANKFURT -- Daimler said deliveries of its Mercedes-Benz passenger cars rose 10 percent in May to 134,031 vehicles, helped by demand for the new C class and the brand's growing lineup of compacts. Five-month deliveries rose to 641,384 cars and SUVs, up 14 percent on the same period last year, Daimler said Friday in a statement. Daimler said sales of the compact range, which comprises the A class, B class, GLA and CLA, increased by 19 percent last month to 37,895. Mercedes' deliveries in China rose 30 percent to 23,011 in May, helped by the April launch of the coupe-like CLA compact in the market. Sales in Mercedes' No. 1 market, the United States, rose 8 percent to 26,617. In Europe, the brand's gains reflected a modest overall rebound in the market as sales rose 5 percent to 60,529, led by a gain of 22 percent in the UK, where sales rose to 10,093. In its biggest European market Germany, Mercedes’ sales fell 3 percent to 21,785. Sales of Daimler's Smart brand dropped 12 percent last month to 7,657. In total, Mercedes-Benz Cars, which includes Smart, sold 141,688 vehicles last month, a rise of 9 percent. Five-month sales rose 12 percent to 680,865. Daimler CEO Dieter Zetsche, who has a goal for Mercedes to pass Audi and BMW and become the world's biggest maker of luxury cars by 2020, is rolling out 30 new vehicles by the end of the decade, a dozen of which will have no predecessor. Last year, Mercedes brand sold 1.46 million cars, behind Audi with 1.58 million and No. 1 global premium sales leader BMW brand with 1.66 million. On Thursday, Audi said it had sold 152,000 cars and SUVs last month, cementing its position as the No. 2 premium carmaker. In the first five months, Audi sold 713,900, a rise of 12 percent. The result gave Audi a lead of 72,516 over Mercedes, up from the 54,547 difference that Audi held in April as its rival began to close the gap. But launches in March of Mercedes' new C-class sedan and the wagon in May may pave the way for a second-half turnaround, analysts say. "Mercedes will surpass Audi after the summer, that's when their refreshed lineup will take off," said Hanover-based NordLB analyst Frank Schwope. BMW has yet to release May sales data.